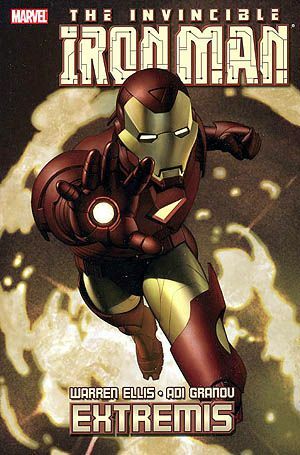 Iron Man is the next contestant in what’s become my regular “Marvel Characters I Actually Don’t Give A Crap About” column. For those of who haven’t seen the movie, here’s Iron Man: He’s smart. He’s rich. He got shot/stabbed/punched in the heart, and invented armour to help him survive. So since the wealth and the supermodels weren’t enough, he now used that armour to turn himself into more of a pretentious douche than he already was. My problem with Iron Man is simple. He has no motivation. He’s rich beyond belief, is one of the smartest people on earth, and could invent his way out of pretty much any problem that comes his way? So why dress up like a drunken Tinman and fight crime? It’s not something Marvel has ever answered properly, but the beauty of Matt Fractio’sn recent run on the character is that he doesn’t even try. Fraction’s Iron Man isn’t recently motivated by altruism so much as self-interest. He wants to save the world, but he doesn’t really care about the citizens of those world. He’d never admit it though. For him, it’s being able to solve problems that is his motivation. This is a refreshing take on the character, but it’s one that I doubt has much left in the bank. Fraction’s run is a decent, well-crafted thrill-ride, and Salvador Larocca has convinced me that he’s one of the preeminent pencillers in the superhero genre today. Good, modern-day take on the character. Before Fraction’s recent run on Iron Man, Marvel hired noted comic book legend and all-around mad god Warren Ellis to attempt to spruce the character up a bit. He succeeded from a superficial standpoint with the Extremis storyline. 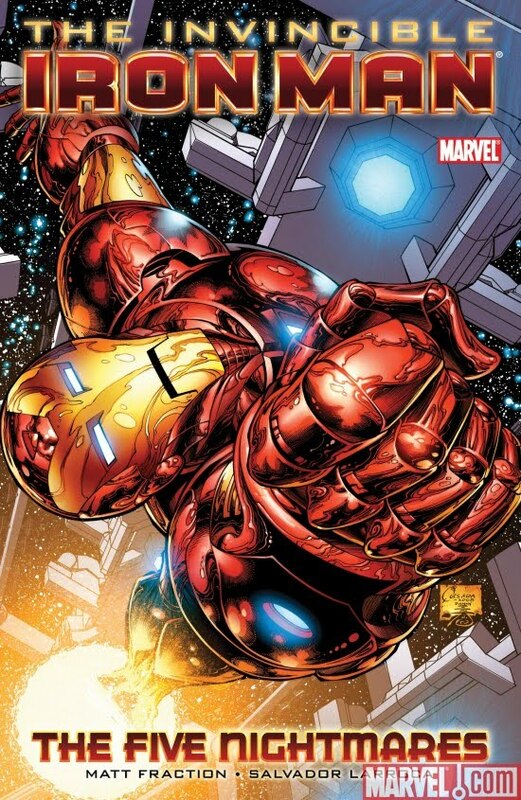 In order to combat a new type of villain, Tony Stark injects himself with an enhancement organism called Extremis. It gives him new powers, a new lease on life, blah blah blah. Blah. This IS an entertaining story. It really is. And every panel by Adi Granov is pin-up worthy. But like most of Ellis’ mainstream superhero work, it comes across as written by someone who really hates superhero comics, as well as by someone who hasn’t read a Marvel comic in decades. Although I enjoyed the story for what it is, there isn’t a single action taken by Tony Stark here that fits into what we know of his history and character. This is a man who has literally fought gods with his bare hands, and we’re to believe that he would inject himself with a virus that could possibly kill him just because he had a tough time in a fight? And not call the rest of the Avengers? As a stand-alone, this works. As a regular part of Marvel continuity, not so much. I usually HATE this kind of story. HATE it. 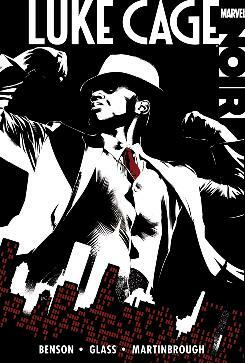 This was Marvel’s recent attempt to capitalize on the recent interest in noir and crime comics. And so instead of creating new and interesting characters to play with, they took their old standbys, and dropped them into a James M. Cain novel. It shouldn’t have worked. Actually, it didn’t. For the most part, these were silly, forced contrivances that weren’t any better than the usual Marvel fare. Except for one. Except for Luke Cage. I guess I shouldn’t have been that surprised. Luke Cage was created as a response to 1970’s blaxploitation movies, which share more than a passing similarity to some of the lighter noir fare. And so Cage not only works as a 1940’s muscle-for-hire, the character thrives on it. This won’t be competing with Brubaker’s Criminal or Azzarello’s 100 Bullets any time soon, but it’s much subtler approach to this type of story than I would have given Marvel credit for in this day and age. This was a bizarre little mini-series by Anne Nocenti and Arthur Adams that snuck under Marvel’s radar in the mid 1980s. It had enough goof and charm that the character has been used intermittently ever since, most often in some X-Capacity or another. I’ve been a big fan of Nocenti’s writing in the past, so I was a little surprised to find that I found this almost unreadable. 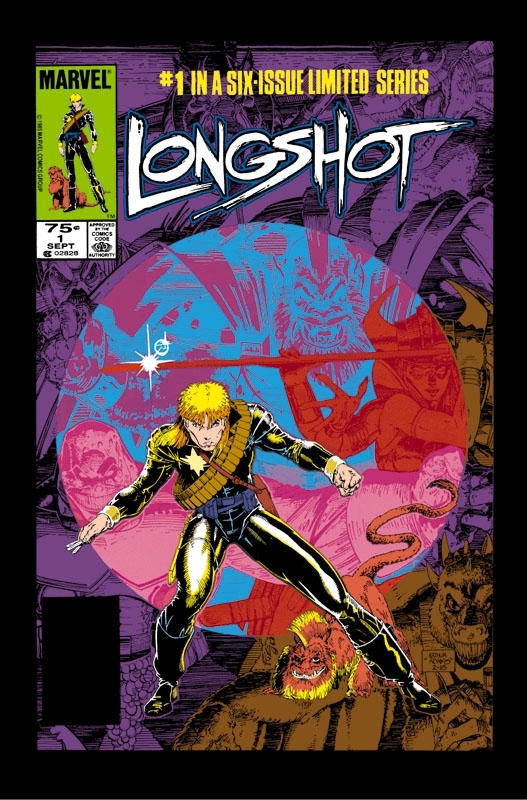 Longshot is your typical “stranger in a strange land” scenario, with the lead character being an escapee from a hell-dimension that is trying to make a go of it on Earth, and runs into a few of Marvel’s more colourful characters while doing so. While the premise seems sound, the execution is so poorly paced, with such goofy characterization, that it’s almost impossible to take seriously. Everything moves at a breakneck pace, with Longshot getting into scrape after scrape with almost no effort to portray him as anything more than a fun-loving, kind-hearted chaos agent. That’s fine, but it also doesn’t stand up to repeated reading. And although Arthur Adams is one of the finest superhero artists of his generation, his art alone isn’t compelling enough to get me to keep this book. About 10 years ago, Grant Morrison had a brief tenure at Marvel which he spent trying to whole heartedly destroy the X-Men. In the middle of that, he took the time to write Marvel Boy, an interesting little mini-series about an alien soldier who has been stranded on earth. 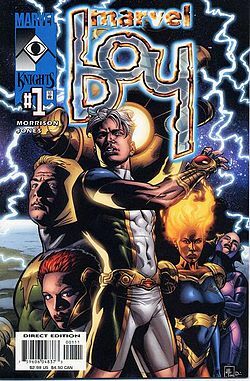 I’ve been very tough on Morrison on this blog (and will continue to be so), but I remember this series fondly. So I was a little surprised to see that it’s as guilty of the usual shoddy storytelling his comics usually offer. If you read a lot of reviews about Morrison’s work, the following observation often comes up: Great concept guy, poor storyteller. And while it’s redundant to go back to that well, it’s really the best way to describe him. I would take it a step further. He’s a brilliant concept guy. Just freakin’ brilliant. The sheer depth of characters, concepts, and realities the man comes up with on a daily basis is astounding. And Marvel Boy is no exception. Morrison throws out so many expansions on the Kree (Aforementioned alien race) Mythology, that it would take Marvel a year to fully capitalize on them. Not to mention Dr. Midas, a truly great Marvel villain in search of a truly great story. But then you get to the other side of Morrison. The side who can’t seem to tell a simple story without adding more exposition than a U. N. Resolution about the evils of exposition. That side is in full force here. And so what starts as a taut thriller, ends up as an incomprehensible mess. I know I’m spending a lot of time talking about a series that I’m culling, but I’ve taken a lot of shots at Morrison without really explaining why. The man seems to be incapable of telling a coherent multi-issue story. The man loses track of characters and plot lines like I lose my glasses. It’s not that bad in something like Marvel Boy, but extremely noticeable in something like Final Crisis, a story so bad it makes Marvel Boy look like Middlemarch. There are comics he’s written I enjoy (All-Star Superman, and…well…I guess just All-Star Superman then), but they are too few and too far between considering his status as the most popular comic writer alive today. And he is. People love him. I don’t think I’ll ever understand why. This entry was posted in Comic Books and tagged Anne Nocenti, Comics, Grant Morrison, Iron Man, Longshot, Luke Cage, Marvel Boy, Marvel Comics, Matt Fraction, Warren Ellis. Bookmark the permalink. The Great Comic Book Cull Of 2010/2011 Part 48: Marvel Comics – Moon Knight!